This post is penned by one of those awesome people you will always see giving more of themselves to help others. Anna is often on the frontline of AEE events welcoming you to the event with smile and is then generally found out on the hill after! Her post for me, sums up perfectly what this project is all about. It’s ‘ordinary’ people helping others and also doing all they can to improve themselves, which for me makes her and everyone who goes about life in the same way, well beyond ‘ordinary’! On seeing the Facebook request from Karl for blog’s I thought ‘I can do that’ although it occurs to me that I often think that about all sorts of things. Which is probably how it happened, this strapping a pack on my back and heading off up a mountain, or through a bog, a forest or babies heads (you get the idea). A few years ago I decided that as my kids were all pretty much self-sufficient it was about time I had an adventure… or maybe a few. Seems perfectly normal to me, get to my mid-forties, never been very fit, or run more than a couple of miles, or been up a mountain, or anywhere much really and needed a challenge, a Para’s 10 followed by a Fan Dance seemed well… normal. Which is what I am, just an ordinary middle aged lady, 3 kids, two ponies, one dog, a part time admin job and living in the flattest part of the country. I also decided this year that I would do a degree with the Open University in the hope that I can get out from behind a desk and in to the outdoors, which I love. 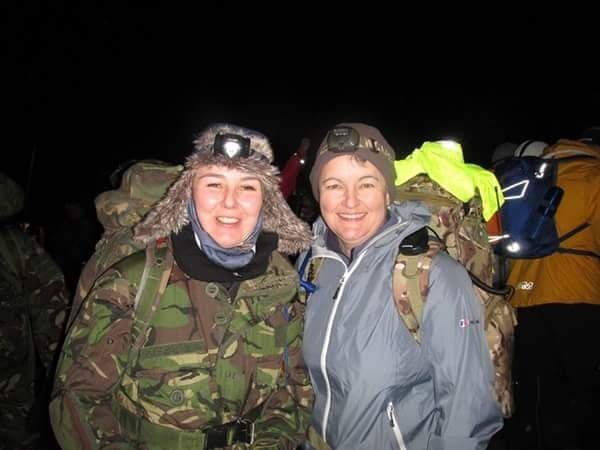 So far I have completed Para’s 10, a great event, and some of the Avalanche Endurance Events too, which is where I met some of the best people I have ever had the privilege of spending time with. These are the kind of events which you can’t explain what you get out of them to someone who has not completed one, and you don’t need to explain to those who have. I’m not sure that I have the words to explain just how much I enjoy these kind of events and days out. I’m not fast, in fact I’m often one of (if not the) last to finish. Progress is slow, but it is progress, although it can be hard not to compare myself with other, fitter and faster people. Sometimes I need to kick myself up the bum to get out and go train, but I think that is the same for everyone, and I struggle with my weight too, but no one said it would be easy, just that it would be worth it. I have, however, developed a deep appreciation for good company, dry socks and a hot brew! Getting to the end of an event or challenge can be a challenge in itself, but I am usually having so much fun that it is definitely worth the effort. Having had a bit of a ‘life exerts itself’ couple of years, I have decided that as I will be fifty next year, this is an excellent reason to push myself out of my comfort zone once again and to have lots of fun! So 2019 for me is fifty fun things for fifty. Kicking off my year with a Fan Dance (of course) I have also entered a half marathon, which will be the furthest I have ever run in one go. The Black Sheep Marathon is on the calendar too, along with Para’s 10, but what else to do? If training goes well I am thinking a 50 mile cycle ride and maybe a 50 km run, I’m not a cyclist or a runner, but I will be 50 so it seems like a perfectly good idea, in fact ‘I think I can do that’ ah nuts there I go again!